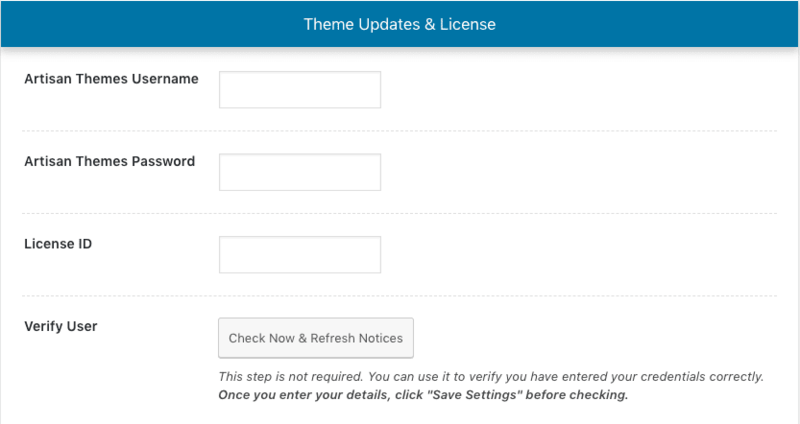 In order to get theme updates right on your WordPress dashboard and participate in the support forums, you will need to activate your theme’s license. Navigate to https://artisanthemes.io/dashboard/ where you’ll find a list of your recent purchases. Locate the “On Domain” area on the product you want to activate and click “Edit”. Fill in the domain for the site you want to activate. If you’ll be working on localhost for the moment, there’s no need to indicate that. Just fill in your actual domain and it’ll work. You can modify this domain twice per license term. Once you activate your site, the theme is ready to connect. Navigate to Theme Options » General tab in your WP dashboard and in the lower part of the page fill in your Artisan Themes credentials and your new License ID for the “THEME LICENSE” area. – If you keep getting an error message after you completed your details in Theme Options, make sure to click the “Check Now & Refresh Notices” button right below the license ID field to refresh the saved data (we cache the response to save performance on your server). – Some servers have issues connecting with WordPress automatic-generated-long passwords, and that’s what our system create for you. If you can’t authenticate your license because of a Password match problem, try re-generating your password here. – There’s no need to enter the ‘http’ or ‘https’ part of your domain in your License domain. If you can’t get your domain to authenticate, try removing that from your saved domain.